Above: A selectively colored image. 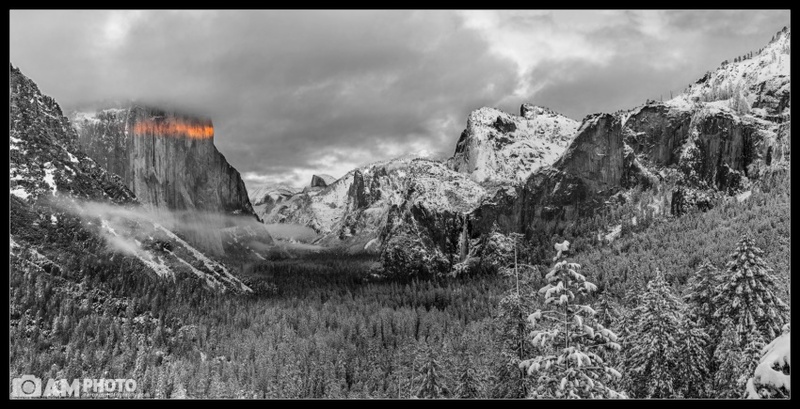 I loved the way the sunset touched El Capitan but the snowy scene seemed perfect for Black and White. Below: The light on El Capitan was so nice on this evening that I couldn’t post just one photo. First, the setting sun imparted the image of a bra onto El Capitan, which I thought was amusing. Next, some color lit up the clouds with a golden hue that also reflected onto El Capitan, Half Dome, and the nearby mountain peaks. 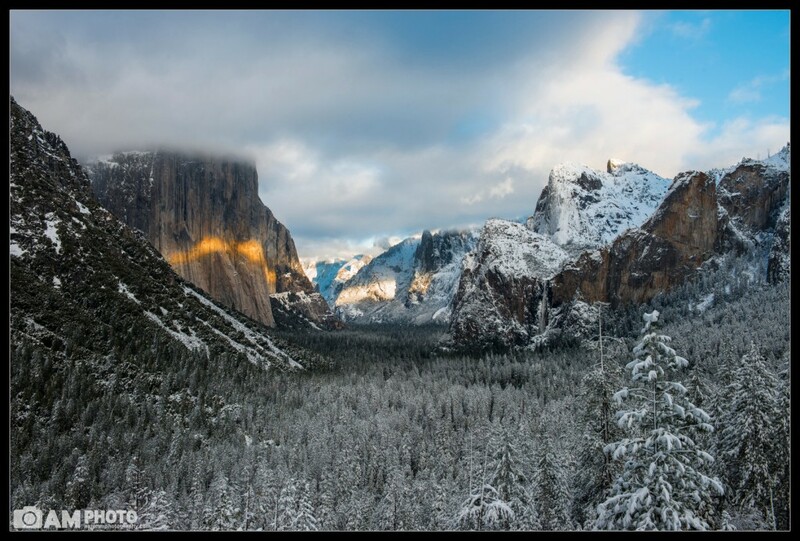 On the top of my photography bucket list has been to witness and photograph a snowy Yosemite. This year I’ve paid close attention to the snow in Yosemite and finally during my Christmas break I had my chance to see Yosemite covered in snow! A giant storm had just hit the Eastern Sierras and dumped about 10 feet of snow (in fact, Kirkwood received 7 feet in ONE DAY!). Willie, Alan, Sammi and I planned on arriving just as the storm cleared. Unfortunately by the time we rented a 4-wheel drive vehicle and made our way through chain control and into Yosemite most of the storm had gone. The radar showed more clouds coming and we held our breath that sunset would be nice. After visiting several stops around the Yosemite Valley and running into a couple other photographers that we knew we settled on returning to Tunnel View for sunset. Joined by a gazillion other photographers (or a ”meat market” as Breezy would call it) we witnessed a beautiful sunset. Although the clouds did not light up with much color there was an absolutely beautiful stripe of color that appeared on El Capitan, as some clouds made enough room for the light to seep in. 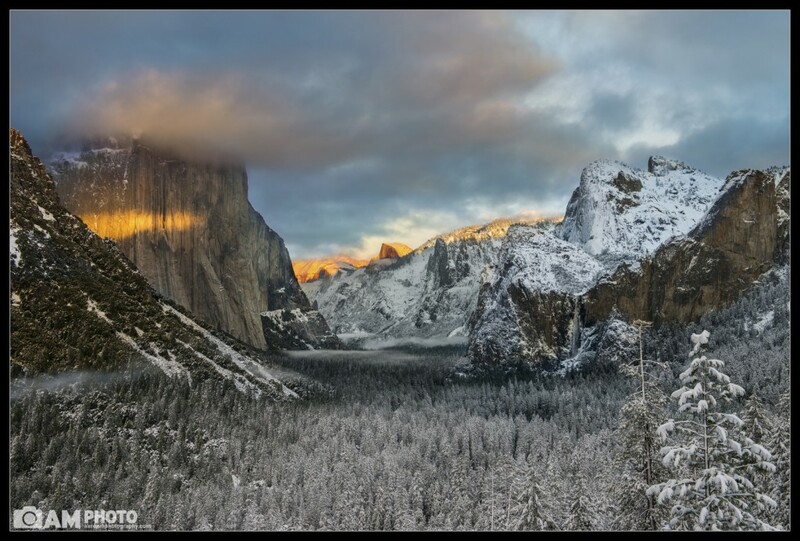 I combined 7 vertical images in Photoshop to create this 2×1 panorama of a snowy Yosemite. With snow on the trees and a pale, boring, blue color in the sky I knew that this photograph had to be done in black and white. I couldn’t help but love the red color that was caste across El Capitan and decided to selectively bring this back in. Fog crept in as the sun began to set and creates a nice mystical mood to the photo. I printed this as a 24”x48” lustre print on Gatorboard and hung it in my office at my apartment! It looks great on the wall!